After splitting up with my sisters yesterday, I met up with my friends (J and S) at Waterfront Station in Vancouver. Our first move was to go from Waterfront Station to Yaletown-Roundhouse Station as the wait for the train was not that long and it’d be a bit faster than walking. There was some interesting entertainment while my friends and I were waiting in the line-ups. People dressed in gold, silver and bronze were living statues. The gold statue was a skier, I’m not sure what the bronze woman was (possibly figure skating, sans skates?) and silver was a snowboarder. 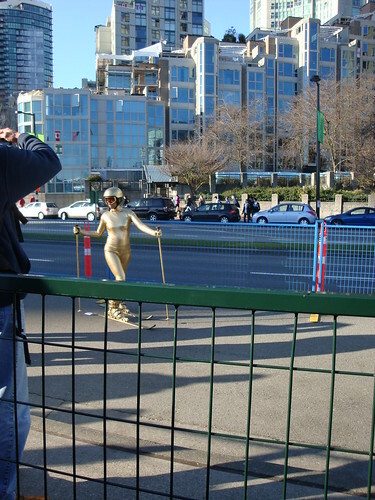 Gold living statue at LiveCity Yaletown – golden skier. 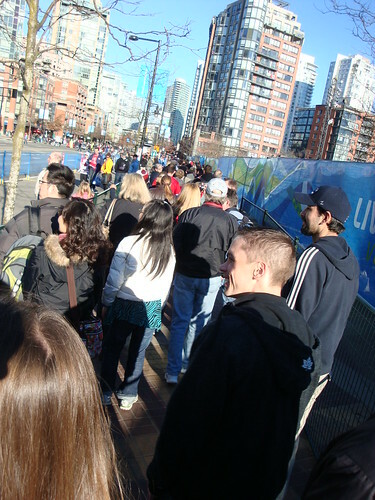 Photo of the line to get into LiveCity Yaletown. 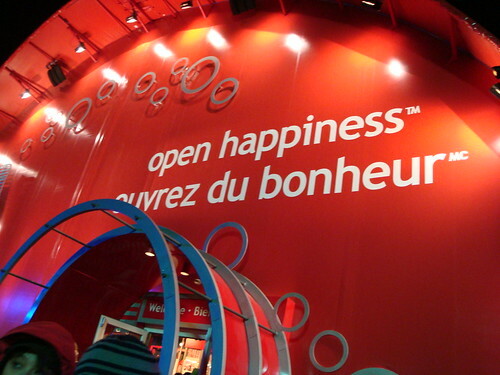 My friends and I wanted to go into the Happiness House (the Coca Cola Pavilion) first, but the staff person at the entrance to the line told us that the line was now closed (their way of ensuring that they don’t have massive wait times, I suppose?). We wandered off to go see other things first. 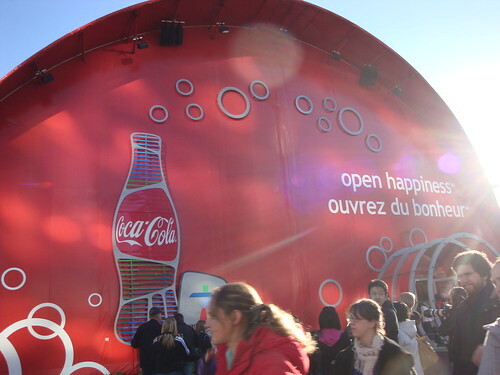 Happiness House, aka the Coca Cola Pavilion, at LiveCity Yaletown. 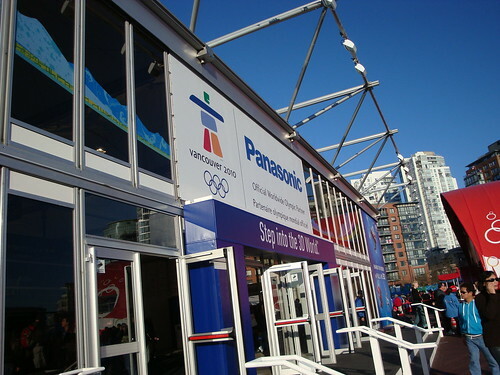 At the Panasonic Pavilion, we waited in line for tickets for a 3D movie and also got to check out some of the new technology, get our photos taken with Olympic mascot plushies and write our own eco-friendly tips that get scanned in to be added to all the other submitted tips. Outside of the Panasonic Pavilion while waiting in line for movie tickets. 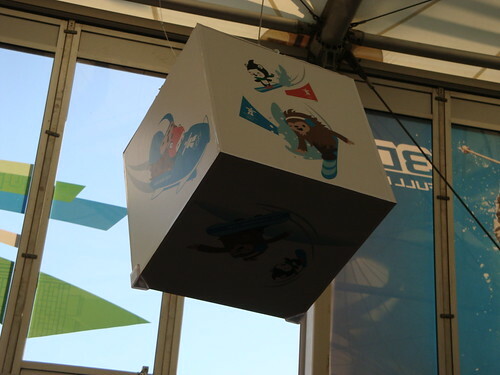 Mascot cubes inside of the Panasonic Pavilion. 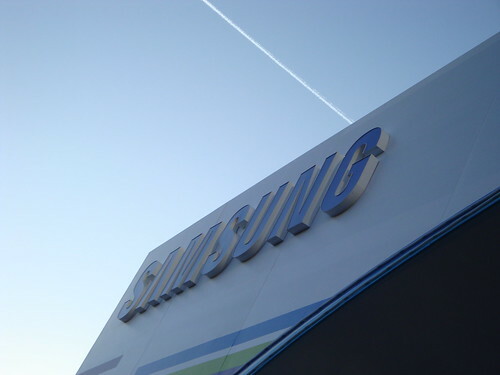 After we left the Panasonic Pavilion, the lines were still closed to the Coke Pavilion, so we lined up for Samsung (another Olympics sponsor). Inside there was live entertainment, a lot of cell phones to try out and some activities to do in order to earn stickers in a passport to exchange for a scratch card. Despite having full passports, we couldn’t get any scratchcards because they had ran out for the day. After that, we went back to the Coca Cola Pavilion and the lineups for open! So we lined up. While in the lines, we watched the hockey game (Canada vs. USA). (Which was an incredibly disappointing game, I must say.) 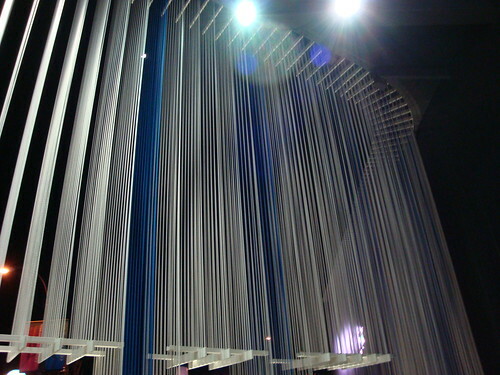 The inside of the Coca Cola Pavilion was fun though! We had to snake through this area that displayed all the styles of Coke bottles that were ever made and even clothing from Coca Cola sponsored Olympics. Even the people working in the Coke Pavilion were wearing clothes that were made from recycled plastic bottles, which I thought was pretty awesome. We got to watch a movie about Coke’s involvement with the Vancouver 2010 torch relay and then after that we got a free drink, did some activities (I got my photo taken with a Vancouver 2010 torch) and then I exchanged my empty Coke bottle for a plastic bottle that changes colour when it’s turned on – very cool indeed. Outside of the Happiness House, about to enter. 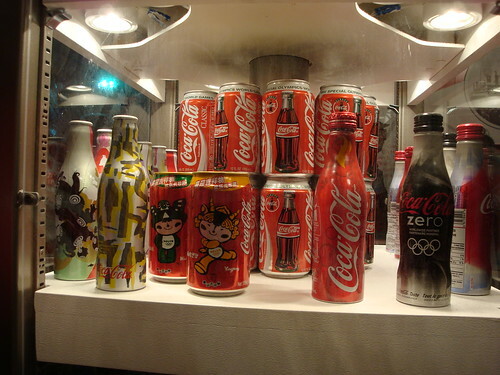 Display of the different looks for Olympics-specific Coca Cola bottles/cans. 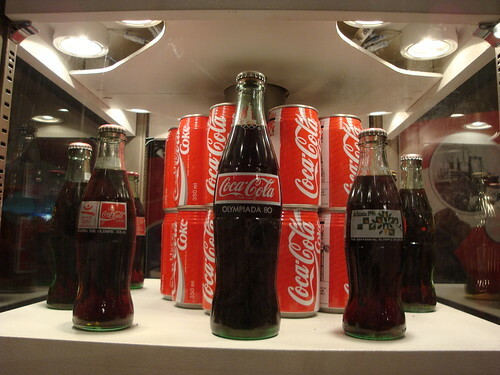 Display of the different looks for Olympics-specific Coca Cola bottles. At this point, it was around 7:30pm and we made our way to a McDonald’s (I’m still on the hunt for some of the more elusive Olympics Happy Meal toys) and we made our way to one that had security at the doors, which was insane in my opinion (but it made going in pretty nice, since they only allowed a maximum of three people lining up at each cash register at any time). I got Happy Meal toy #1 (now I’m only missing #2 and #3) and we ate dinner there before wandering some more. It was at this point we decided to make our way to Ontario House and the map that I had was missing the street that we were on (go figure) so we asked a pair of police officers how to get to where we wanted to go. In their opinion, my map was crappy and they directed us to the general direction that we should go. Problem was is that even they couldn’t remember which roads were closed to pedestrians! We eventually made our way there and got to Ontario House and we watched the 4D movie (the chairs moved, there were bubbles, fake snow, water being sprayed in our faces and also smells of hot chocolate, trees, snow, etc.) which showcased the province of Ontario, but it was really fun, since there was so much going on. On our way to Ontario House, spotted an amazing view of Science World (a.k.a. 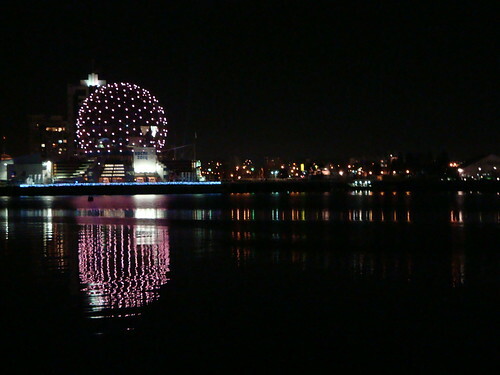 Sochi World) with the lights reflecting on False Creek. Inside of Ontario House, waiting a very short amount of time to watch a 4D movie. It was a really fun day, getting to see so much with different people (Royal Canadian Mint Pavilion and Northern House,with my sisters, and LiveCity Yaletown and Ontario House with two of my friends). It was definitely a fun-filled day but now I’m just glad to have a day to relax for a bit I did do a lot of exercise yesterday and my legs could use a bit of a rest. Sounds like you had such a fun, busy day! The 4D ride thinger especially sounded like so much fun. I've been on one similar to that before, but it didn't have near as much as yours did going on. Nice pictures, and it was good seeing you after like forever.